Every October, the IRS takes a look at the Consumer Price Index for the 12 months from September to September and determines what changes should be made in terms of cost of living increases for Social Security, as well as the rules for contributions to tax-advantaged retirement plans. This year, the IRS has announced a 1.7 percent cost-of-living increase for Social Security. The news means that seniors will receive a little bit more money in their social security benefits checks each month. However, this increase might not be all that helpful to some seniors. First of all, the reality is that the Consumer Price Index isn’t always considered the best measure of inflation when it comes to setting policy that affects people on a more practical, day-to-day level. This is especially true when you consider that housing and food prices often rise at a faster rate than CPI. Utilities also tend to rise faster than inflation. Social Security was never meant to replace income for seniors, and it is clear that it becomes increasingly clear that most seniors aren’t going to be able to live on it anyway, even if they are very frugal. In some cases, Social Security benefits might not even be enough to properly supplement. If you aren’t ready to retire, it might make sense for you to consider doing what you can to build up your nest egg so that you don’t have to rely much on Social Security. And the news is good on the saving more front, because the IRS has announced an increase in contribution limits for 401(k)s.
The IRS also announced changes to retirement account contribution limits. The limit for 401(k)s was raised to $18,000, up from last year’s limit of $17,500. The catch-up contribution (for those aged 50 and older) has also been raised, up to $6,000 from the previous contribution limit up $5,500. This is good news for savers. One of the advantages of being able to contribute more is that you have the chance to boost your overall nest egg. While inflation plays a role, the reality is that your ability to retire successfully is more likely when you are able to invest. Rather than hoping for a cost-of-living increase that can benefit you while you take Social Security, you can take matters into your own hands. The tax-advantaged nature of a 401(k) — especially when enhanced if you have an employer that matches contributions — does a lot to help you build wealth more efficiently. Take advantage of compound interest by boosting your retirement contribution. Even if you can’t max out the contribution yet, you should still consider boosting your retirement account contribution in 2015. Unfortunately, IRAs aren’t seeing the same contribution limit increase. The maximum contribution remains $5,500 a year, with a catch up contribution of $1,000. 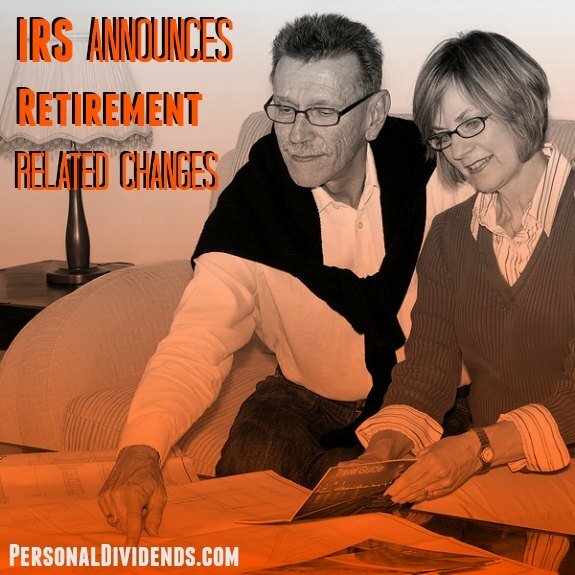 The IRS did decide to raise the income limit for those making contributions to Roth IRAs. So you can make contributions with a slightly higher income now, and the phaseout level for the tax deduction on a Traditional IRA is also higher. It’s not quite the same as seeing a higher contribution limit, but it’s not awful. The bottom line, though, is that you need to take retirement into your own hands. You will not be able to retire comfortably if you expect Social Security to be there for you. As you see, the Social Security benefits only increase with inflation, as measure by CPI. In practical terms, it won’t help you. It makes more sense to shore up your finances with a long-term investing plan that involves tax-advantaged retirement investment accounts that can grow your nest egg at a rate much faster than inflation. I know I was happy to see the increase for limits for Roth and the 401k. Not sure if Roth IRA’s are going to grow very much over time.